The unconscious mind (or the unconscious) consists of the thoughts in the mind that occur automatically and are not available to introspection, and include thought processes, memory, affect, and motivation. Even though these processes exist well under the surface of conscious awareness they are theorized to exert an impact on behavior. The term was coined by the 18th-century German romantic philosopher Friedrich Schelling and later introduced into English by the poet and essayist Samuel Taylor Coleridge. The concept was developed and popularized by the Austrian neurologist and psychoanalyst Sigmund Freud. Empirical evidence suggests that unconscious phenomena include repressed feelings, automatic skills, subliminal perceptions, thoughts, habits, and automatic reactions, and possibly also complexes, hidden phobias and desires. In psychoanalytic theory, unconscious processes are understood to be expressed in dreams in a symbolical form, as well as in slips of the tongue and jokes. 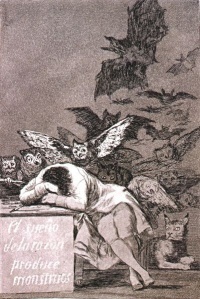 Thus the unconscious mind can be seen as the source of dreams and automatic thoughts (those that appear without any apparent cause), the repository of forgotten memories (that may still be accessible to consciousness at some later time), and the locus of implicit knowledge (the things that we have learned so well that we do them without thinking). It has been argued that consciousness is influenced by other parts of the mind. These include unconsciousness as a personal habit, being unaware, and intuition. Terms related to semi-consciousness include: awakening, implicit memory, subliminal messages, trances, hypnagogia, and hypnosis. While sleep, sleep walking, dreaming, delirium, and comas may signal the presence of unconscious processes, these processes are not the unconscious mind itself, but rather symptoms. Influences on thinking that emanate from outside of the individual's self-generated consciousness are reflected in the ancient ideas of temptation, divine inspiration and the role of the gods in influencing motives and actions. The idea of internalised unconscious processes in the mind also originated in antiquity and has been explored across cultures. Unconscious aspects of mentality were referred to between 2500 and 600 BC in the Hindu texts known as the Vedas, found today in Ayurvedic medicine. In the Vedic worldview, consciousness is the basis of physiology and pure consciousness is "an abstract, silent, completely unified field of consciousness" within "an architecture of increasingly abstract, functionally integrated faculties or levels of mind". 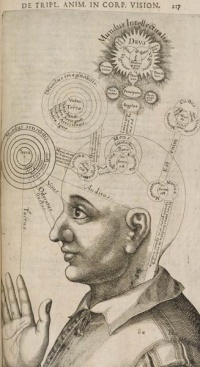 Paracelsus is credited as the first to make mention of an unconscious aspect of cognition in his work Von den Krankheiten (translates as "About illnesses", 1567), and his clinical methodology created a cogent system that is regarded by some as the beginning of modern scientific psychology. 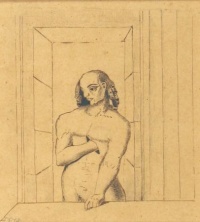 Shakespeare explored the role of the unconscious in many of his plays, without naming it as such. Western philosophers such as Spinoza, Leibniz, Schopenhauer, Kierkegaard, and Nietzsche, developed a western view of mind which foreshadowed those of Freud. Schopenhauer was also influenced by his reading of the Vedas. Articulating the idea of something not conscious or actively denied to awareness with the symbolic constructs of language has been a process of human thought and interpersonal influence for millennia. The resultant status of the unconscious mind may be viewed as a social construction—that the unconscious exists because people agree to behave as if it exists. Symbolic interactionism goes further and argues that people's selves (conscious and unconscious) though purposeful and creative are nevertheless social products. Some neuroscientific research supports the proposition of the unconscious mind. For example, researchers at Columbia University Medical Center have found that fleeting images of fearful faces—images that appear and disappear so quickly that they escape conscious awareness—produce unconscious anxiety that can be detected in the brain with the latest neuroimaging machines. The conscious mind is hundreds of milliseconds behind the unconscious processes. To understand this type of research, a distinction has to be made between unconscious processes and the unconscious mind: they are not the same. Neuroscience is more likely to examine the former than the latter. The unconscious mind and its expected psychoanalytic contents are also different from unconsciousness, coma and a minimally conscious state. The differences in the uses of the term can be explained, to a degree, by different narratives about what we know. One such narrative is psychoanalytic theory. Probably the most detailed and precise of the various notions of 'unconscious mind'—and the one which most people will immediately think of upon hearing the term—is that developed by Sigmund Freud and his followers. It lies at the heart of psychoanalysis. Consciousness, in Freud's topographical view (which was his first of several psychological models of the mind), was a relatively thin perceptual aspect of the mind. The unconscious was considered by Freud throughout the evolution of his psychoanalytic theory a sentient force of will influenced by human drive and yet operating well below the perceptual conscious mind. For Freud, the unconscious is the storehouse of instinctual desires, needs, and psychic actions. While past thoughts and memories may be deleted from immediate consciousness, they direct the thoughts and feelings of the individual from the realm of the unconscious. In this theory, the unconscious refers to that part of mental functioning of which subjects make themselves unaware. Freud proposed a vertical and hierarchical architecture of human consciousness: the conscious mind, the preconscious, and the unconscious mind—each lying beneath the other. He believed that significant psychic events take place "below the surface" in the unconscious mind, like hidden messages from the unconscious—a form of intrapersonal communication out of awareness. He interpreted these events as having both symbolic and actual significance. For psychoanalysis, the unconscious does not include all that is not conscious, rather only what is actively repressed from conscious thought or what the person is averse to knowing consciously. In a sense this view places the self in relationship to their unconscious as an adversary, warring with itself to keep what is unconscious hidden. The therapist is then a mediator trying to allow the unspoken or unspeakable to reveal itself using the tools of psychoanalysis. Messages arising from a conflict between conscious and unconscious are likely to be cryptic. The psychoanalyst is presented as an expert in interpreting those messages. For Freud, the unconscious was a repository for socially unacceptable ideas, wishes or desires, traumatic memories, and painful emotions put out of mind by the mechanism of psychological repression. However, the contents did not necessarily have to be solely negative. In the psychoanalytic view, the unconscious is a force that can only be recognized by its effects—it expresses itself in the symptom. Unconscious thoughts are not directly accessible to ordinary introspection, but are supposed to be capable of being "tapped" and "interpreted" by special methods and techniques such as meditation, random association, dream analysis, and verbal slips (commonly known as a Freudian slip), examined and conducted during psychoanalysis. Freud's theory of the unconscious was substantially transformed by some of his followers, among them Carl Jung and Jacques Lacan. Carl Jung developed the concept further. He divided the unconscious into two parts: the personal unconscious and the collective unconscious. The personal unconscious is a reservoir of material that was once conscious but has been forgotten or suppressed. The collective unconscious is the deepest level of the psyche, containing the accumulation of inherited psychic structures and archetypal experiences. There is considerable two-way traffic between the ego and the personal unconscious, such as when one's mind wanders to thoughts irrelevant to the current situation. Jacques Lacan's psychoanalytic theory contends that the unconscious is structured like a language. If the unconscious is structured like a language, Lacan argues, then the self is denied any point of reference to which to be "restored" following trauma or "identity crisis". In this way, Lacan's thesis of the structurally dynamic unconscious is also a challenge to the ego psychology of Anna Freud and her American followers. A fundamental premise of the concept of the Lacanian unconscious is the letter and the function of the signifier in relation to the unconscious (see "The Purloined Letter" and "The Agent of the Letter in the Unconscious," in Ecrits). In his later Seminars, Lacan began to explain the unconscious through the logic of knots. Lacan's idea of how language is structured is largely taken from the structural linguistics of Ferdinand de Saussure and Roman Jakobson, based on the function of the signifier and signified in signifying chains. The starting point for the linguistic theory of the unconscious was a re-reading of Freud's The Interpretation of Dreams. There, Freud identifies two mechanisms at work in the formation of unconscious fantasies: condensation and displacement. Under Lacan's linguistic reading, condensation is identified with the linguistic trope of metaphor, and displacement with metonymy. Lacan applied the ideas of de Saussure and Jakobson to psychoanalytic practice. For example, while de Saussure described the linguistic sign as a relationship between a signified and an arbitrary signifier, Lacan inverted the relationship, putting in first place the signifier as determining the signified, and so being closer to Freud's position that human beings know what they say only as a result of a chain of signifiers, a-posteriori. Lacan began this work with the case of Emma (1895) from Freud, whose symptoms were disenchained in a two-phase temporal process. Its repercussions are most strongly felt in literary/critical theory, as well as among those who practice Lacanian analysis. Today, there are still fundamental disagreements within psychology about the nature of the unconscious mind. It may simply stand as a metaphor that ought not to be refined. Outside formal psychology, a whole world of pop-psychological speculation has grown up in which the unconscious mind is held to have any number of properties and abilities, from animalistic and innocent, child-like aspects to savant-like, all-perceiving, mystical and occultic properties. There is a great controversy over the concept of an unconscious in regard to its scientific or rational validity and whether the unconscious mind exists at all. Among philosophers, Karl Popper was one of Freud's most notable contemporary opponents. Popper argued that Freud's theory of the unconscious was not falsifiable, and therefore not scientific. He objected not so much to the idea that things happened in our minds that we are unconscious of, but to investigations of mind that were not falsifiable. If one could connect every imaginable experimental outcome with Freud's theory of the unconscious mind, then no experiment could refute the theory. In the social sciences, John Watson, considered to be the first American behaviourist, criticized the idea of an "unconscious mind," using a similar line of reasoning, and instead focused on observable behaviors rather than on introspection. Unlike Popper, the epistemologist Adolf Grunbaum argued that psychoanalysis could be falsifiable, but its evidence has serious epistemological problems. David Holmes examined sixty years of research about the Freudian concept of "repression", and concluded that there is no positive evidence for this concept. Given the lack of evidence of many Freudian hypotheses, some scientific researchers proposed the existence of unconscious mechanisms that are very different from the Freudian ones. They speak of a "cognitive unconscious" (John Kihlstrom), an "adaptive unconscious" (Timothy Wilson), or a "dum unconscious" (Loftus & Klinger), which executes automatic processes but lacks the complex mechanisms of repression and symbolic return of the repressed. Another contemporary philosopher, John Searle, has written a convincing critique of the Freudian unconscious. He contends that the very notion of a collection of "thoughts" that exist in a privileged region of the mind such that they are in principle never accessible to conscious awareness, is incoherent. This is not to imply that there are not "nonconsious" processes that form the basis of much of conscious life. Rather, Searle simply claims that to posit the existence of something that is like a "thought" in every way except for the fact that no one can ever be aware of it (can never, indeed, "think" it) is an incoherent concept. To speak of "something" as a "thought" either implies that it is being thought by a thinker or that it could be thought by a thinker. Processes that are not causally related to the phenomenon called thinking are more appropriately called the nonconscious processes of the brain. These ideas are discussed more at length in his book The Rediscovery of the Mind. Other critics of Freudian unconscious were Hans Eysenck, Jacques Van Rillaer, Frank Cioffi, Marshal Edelson, Edward Erwin. Another line of (non-psychoanalytic) early research on unconscious processes was initiated by Arthur Reber, using so-called "artificial grammar" methodology. That research revealed that individuals exposed to novel words created by complex sets of artificial, synthetic "grammatical" rules (e.g., GKHAH, KHABT...), quickly develop some sort of a "feel" for that grammar and subsequent working knowledge of that grammar, as demonstrated by their ability to differentiate between new grammatically "correct" (i.e., consistent with the rules) and "incorrect" (inconsistent) words. Interestingly, that ability does not appear to be mediated, or even accompanied by the declarative knowledge of the rules (i.e., individuals' ability to articulate how they distinguish between the correct and incorrect words). Jacques Lacan's assertion that "the unconscious is structured like a language". Unless indicated otherwise, the text in this article is either based on Wikipedia article "Unconscious mind" or another language Wikipedia page thereof used under the terms of the GNU Free Documentation License; or on original research by Jahsonic and friends. See Art and Popular Culture's copyright notice. This page was last modified 08:37, 3 January 2016.